To Cite: Chiriac A, Solovan C, Pinteala T, Ed Chiriac A, Brzezinski P, et al. The Relationship Between Psoriasis and Specific Professional Activities or Occupation-Induced Skin Diseases, Shiraz E-Med J. 2014 ; 15(2):e20591. doi: 10.17795/semj20591. Background: Psoriasis is a systemic, immune-mediated disease, associated with significant comorbidities, with a high negative impact on the quality of life. Objectives: The aim of this study was to evaluate the profession of patients diagnosed with psoriasis and establish a correlation between the disease and occupation. Patients and Methods: In an outpatient clinic, 1236 patients were diagnosed with psoriasis during eight years (2004-2011) and followed up for different clinical parameters and details in their working places. Results: Of 1236 patients, 669 were male (54.13%) and 567 (45.87%) female, with a predominance of male over female (1.18/1); the median age at diagnosis was 29.34 ± 15.24; the retired individuals were mostly representatives (149, 12.6%), followed by pupils (112, 9.06%), employees (108, 8.74%), engineers (87, 7.04%), students (70, 5.66%), managers (56, 4.53%), housewives (54, 4.37%), professors (53, 4.28%), drivers (46, 3.72%), salesmen (39, 3.16%), economists (38, 3.07%), healthcare professionals (32, 2.59%). Others were unemployed (71 - 8.77%) or had other occupations. Conclusions: The results did not conclusively declare psoriasis as an occupational or occupational-induced disease. Psoriasis is a systemic chronic inflammatory disease with a significant impairment on quality of life and work productivity (1). Great majority of patients with psoriasis complain of self-consciousness, embarrassment, depression, social isolation, stigmatization (2, 3), and significant impairment of work productivity (4, 5). The impact of psoriasis on quality of personal and professional life is well recognized. The aim of this study was to find a correlation between psoriasis and working place or job of the patients. A retrospective study was conducted on 1236 patients with psoriasis in a single center, managing psoriasis during 2004-2011. The patients were examined in an outpatient Clinic by trained dermatologists and the following variables were noted: age, gender, age at diagnosis, family history of psoriasis, residence, level of education, job. Diagnosis of psoriasis was based on clinical grounds, and when necessary, it was certified by skin biopsy. The patients were asked to fill in some questionnaires and the personal data were collected. Our results confirmed the high prevalence of psoriasis in working people as 65.74%; retired persons: 12.06%, pupils: 9.06%, home workers or housewives: 4.37%; unemployed individuals: 8.77% (Table 1). An occupational disease is defined as one that is caused or worsened by working (6). The terminology of occupationally-induced psoriasis was used by Moroni in 1998 (7), who reported 1.2% of all occupational dermatoses as work-related psoriasis (3000 patients were enrolled in the study). 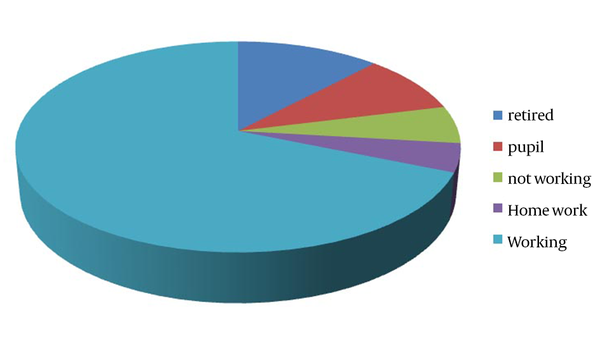 A German study on 1901 patients with occupational dermatoses in 2009 by Skudlik et al. (8) showed that 73 patients (3.8%) were diagnosed with psoriasis of the hands; in 42 cases (2.2%), a profession-related context was admitted (mechanical repeated microtrauma, wet conditions of work, contact with irritants). It is now admitted that pressure, trauma, and work-related friction may cause psoriasis of hands and fingers (9). A number of papers have been published during the last decades concerning the idea of occupational psoriasis (mostly palmar-type) (9-12). 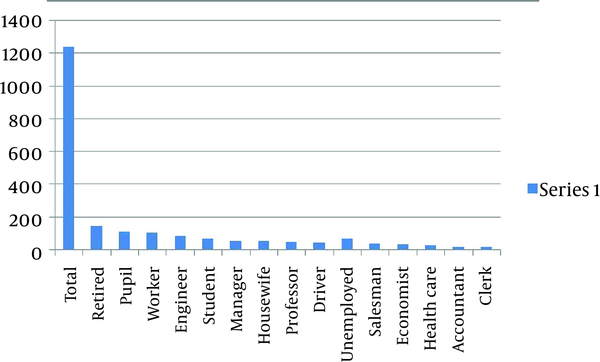 A list of professions with high incidence of work-related psoriasis was published (9-12), including the following risky jobs: baker, barkeeper, bookbinder, bus driver, cashier, cleaner, construction worker, dentist, draftsman, electrician, joiner, manufacturing/packaging worker, masseur, mechanic, newspaper vendor, pharmacist, seamstress, and tailor (13). A more recent study was published in the USA by the National Psoriasis Foundation, survey data of 2003–2011 (2), and pointed out that psoriasis was prevalent in working people (64%) (full-time workers: 48%; part-time workers: 11%; homemakers: 5%). 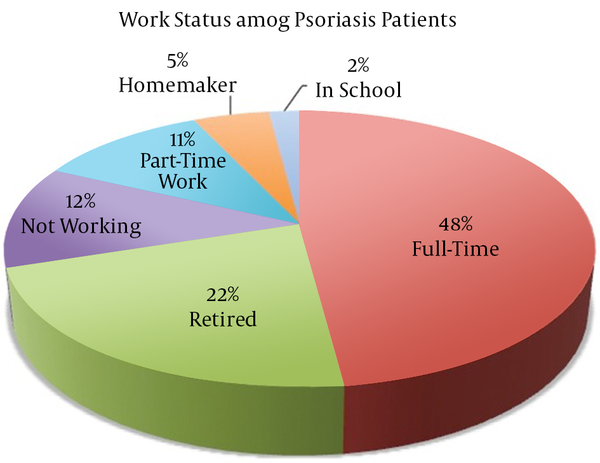 Retired people were diagnosed with psoriasis in 22% of cases, jobless people in 12%, and children attending school in 2%. No details about specific activities of psoriasis patients were reported (Figure 1). Psychosocial stress may play a role in exacerbation of psoriasis (14); also, alcohol consumption may correlate with prevalence of psoriasis in working people. A slight increase in prevalence of psoriasis in farmers exposed to pesticides was verified in India in 2011 (15); but further studies must be performed following this pathway. Geographic variations and climatic factors such as sun exposure and humidity could influence the prevalence of psoriasis and explain (among other factors) the variability of disease incidence all over the world (16). Work-related physical activity is proved to be correlated with onset of psoriatic arthritis (17). Table 2 shows the latest distribution of population in Romania. The present study was performed on 1236 patients diagnosed with psoriasis during an eight-year period (2004-2011) in the north-eastern part of Romania, covering approximately one third of the population. The results revealed the high prevalence of psoriasis in working people as 65.74%; retired persons: 12.06%; pupils: 9.06%; home workers (housewives): 4.37%; unemployed people: 8.77% (Figure 2). A deeper look inside the study put in evidence the specific repartition among jobs: simple workers (with no qualification and hard work): 8.74%; engineers: 7.04%; students: 5.66%; managers: 4.53%; professors: 4.28%; drivers: 3.72%; salesmen: 3.16%; economists: 3.07%; medical carriers: 2.59% (Tabel 1) (Figure 3). Fenomen Koebner was observed in 173 patients (14%). Palmar involvement was the type of psoriasis recognized in 205 patients (16.59%) (Table 3). Our data confirmed the high prevalence of psoriasis in working people, especially ones with stressful activities: engineers, students, professors, managers, drivers, salesmen, and medical staff. Physical activity, alcohol consumption, smoking, working place pollution, repeated trauma, and irritants are linked to psoriasis in workers. Retired persons encounter frequent manifestations of psoriasis after a long evolution of the disease (psoriasis march); they spend time and money to search for medical help. Chronic infections, comorbidities, and drug administration could be triggering factors for psoriasis flares. The results did not conclusively declare psoriasis as an occupational or occupational-induced disease and further studies will be required.